Good morning polished world! How are you all doing on this Thursday?? It was a super cold rainy day yesterday, and today it's supposed to be a tad warmer. I hope it does warm up a bit because I feel like I'm starting to get a cold, and if the weather evens out, I think that the cold will go away. Maybe? Who knows. Continuing on with another Halloween manicure today! 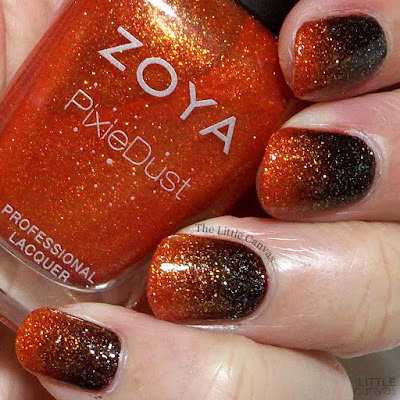 Last year Jessica from LaLaLoveNailArt on Instagram created the most perfect PixieDust gradient using Dhara and Dahlia. I wanted to re-create it last year but never got around to doing so. Of course that meant that I needed to do it right away. Sadly though I don't like the look on my nails as much as I did on Jessica, but it's still an awesome manicure. I mean, it is a cool looking design. Now, Jessica kept hers matte, but I made mine shiny because the matte texture was kind of driving me insane. At first I regretted adding the top coat, but they turned out to be so sparkly. Literally my nails looked like black to orange gems. I think the reason I wasn't a complete fan of this manicure was because it really was not easy to do. I have done a gradient in the past with Pixie Dusts, and I forgot how difficult they are to do. Maybe it's just me, but it takes forever for the colors to turn out how you want them to. I also found it hard to get it evenly distributed. What do you think? Like this gradient? Think I should have kept it matte?